NOTE - We have detected that you are browsing our site from the USA. PKR.com does NOT accept poker players located in the USA. To play online poker, please view our list of the best USA poker sites. Other poker sites have toyed with the concept of 3D poker but none of them ever implemented with such an all-out intensity as PKR Poker (www.PKR.com) . In 2006, PKR became the first mainstream poker site to offer players a completely immersive 3D experience. The idea was simple: provide poker players with the most realistic poker experience possible outside of a traditional casino. PKR is a 100% unique online poker room that offers mind-blowing 3D poker software. 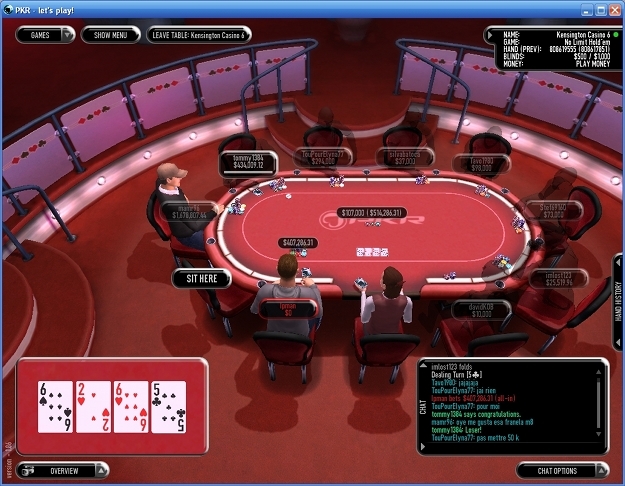 Instead of the traditional overhead view used by other online poker rooms, PKR chose to develop custom three-dimensional software that features slick player animations and immersive table environments. Plus, if you sign up at the PKR poker room with bonus code PK800, you will automatically receive a 100% up to $800 bonus on your first deposit. for a 100% up to $800 Bonus! Much of the poker world was skeptical, figuring that PKR would be just another gimmicky poker site that offered sweet graphics but little substance. Within days, however, PKR proved itself to be a well rounded poker site that offered stunning 3D graphics along with everything else one would expect from an online poker room. A large player base, big prize pool tournaments and one of the industry’s biggest sign-up bonuses quickly made PKR a hit. More than just fancy software awaits all new players at PKR. Players who sign up at PKR and use PKR bonus code PK800 will receive a 100% bonus for up to $800 on their first deposit there. This bonus can be claimed by signing up for an account, making a deposit, and typing in the bonus code when asked for it. The PKR bonus is cleared by earning PKR Points at the real money tables. Players will have to earn 225 PKR Points per dollar in bonus money. That might sound like a lot but PKR gives out points like candy. Players earn 100 PKR Points per dollar paid in tournament fees and players can earn up to 300 PKR Points per hand in cash games. Unlike most poker sites, PKR releases its bonus as a lump sum bonus. This means that once the bonus has been claimed, players must clear the entire bonus before they see the money. The result is that players have to wait longer to see the money but when they finish clearing the bonus, they get a big chunk of money all at once. For a further discussion of the PKR bonus offer, check out our new, complete guide to PKR poker bonuses. There’s more to the player avatars than just looks, however. The players are fully animated and can be controlled to perform dozens of actions such as peek at the cards, give off tells, laugh and express a wide range of emotions. Players can even show off their prestige through their clothing and accessories with items that can only be earned by winning tournaments or accumulating frequent player points. There’s good news for multi-tablers, too. Thanks to a variety of viewpoints, including the traditional overhead view, PKR supports up to four tables at a time. In addition to that, the software provides players with the ability to take notes on their opponents, sort the tables list, and keep track of friends/fish with a buddy list. PKR hosts many tournaments every day so that no matter what time it is, a new tournament is always about to start. The variety of tournament types is one of the broadest we’ve seen in a poker site to date. Players can participate in double-or-nothing tournaments, winner take all tournaments, bounties, shootouts, step tournaments, rebuy/addons, deep stack tournaments, turbos and more. Guaranteed prize pool tournaments are also popular but still have a ways to go to compete with some of the bigger poker sites. The biggest regular guaranteed tournament is held every other Saturday and it features a $100,000 guaranteed prize pool. The next biggest tournament is also held on alternating Saturdays and guarantees a prize pool of $40,000. Sit-n-go tournaments run around the clock as well and have buyins that range from $1 to $1,000. These tournaments also come in several variations such as double or nothing, winner take all, heads-up and multi-table. The variety of buyins and tournament types will appeal to tournament players of all types. PKR is still a fairly new poker site compared to the more established poker sites but player traffic is picking up. There are always thousands of players logged in but the player base isn’t yet large enough to provide players with massive tournaments or loads of cash games. The majority of the action takes place at small and medium stakes Texas Holdem tables. The good news is that the competition at PKR is much softer than average. PKR attracts a lot of casual players who are more interested in the 3D experience than in grinding it out at the poker tables all day. If you can deal with the lower-than-average player traffic, you’ll find PKR a very rewarding place to play. Withdrawals from PKR are usually processed back out through the same method used to deposit. Credit and debit cards can’t always be credited, however, so PKR will occasionally have to return your money through one of its other payment options. Players can also elect to have paper checks mailed to them. The support team at PKR is friendly and knowleadgable, and PKR has actually won several awards for their outstanding customer service. You can reach the PKR poker support team via Live Chat or by e-mail. We recommend using the Live Chat feature as you can receive instant help from the suppot team. Ready to Play? Visit PKR Poker to Get Started Now! Now that you know everything about PKR.com, it's time to get started. Sign up at PKR Poker with bonus code PK800 to automatically receive our exclusive 100% up to $800 sign up deposit bonus.